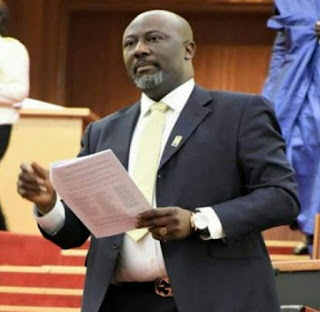 The Independent National Electoral Commission, INEC, has released the timetable for the recall of Senator representing Kogi West, Dino Melaye. The process is set to start on Tuesday, March 27, 2018. This was part of a statement released by INEC on Friday, signed by its Secretary, Mrs . Augusta Ogakwu. The statement contained the timetable and schedule of activities for the recall process. It would start with the posting of the notice of verification at the commission’s office in Lokoja, Kogi State and end with the declaration of the outcome of the verification on April 29, 2018. INEC said it had proceeded with the move pursuant to a judgment by the Court of Appeal, Abuja, delivered on March 16 , 2018. The statement said, “Pursuant to the judgment of the Court of Appeal, Abuja Division , delivered on March 16, 2018 , the Independent National Electoral Commission hereby issues this timetable and schedule of activities for the recall of the senator representing Kogi West Senatorial District, Kogi State. It said that April 4 is set as the last day for submission of application by interested observers, while April 20 is set as the last day for the submission of the names of verification agents for the member sought to be recalled and the petitioners. A stakeholders’ meeting for the matter is expected to hold on April 25 at INEC ’s state office; conduct of verification on April 28 in all polling units in the constituency and declaration of the outcome of verification on April 29 at the commission’s Local Government Area office in Lokoja.